Najee was in town recently and played a four night run at the famed Blues Alley Jazz Club in the Georgetown area of Washington, DC. It’s always a good thing when Najee comes to town because you know he’s going to put on a fantastic show. What’s makes a good show even better is when the crowd is into the music and the musicians, as they were for this first show of the night. When it all comes together like that, it’s magical. 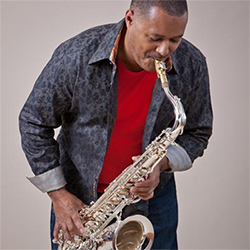 Najee has been making quality music throughout 13 albums and 28 years. From his 1986 debut release Najee’s Theme, to his latest project, The Morning After: A Musical Love Journey, there is an extensive musical catalog to choose from. I often wonder how artists who have such successful longevity like Najee, choose which songs to include in their set lists. Of course, you can’t play everything, and someone, somewhere will be disappointed because he didn’t play “their” song. Najee did his best to cover as much material as possible, but even he acknowledged that he couldn’t please everybody. Nevertheless, what he gave us that night hit the mark. By shows end, we were happy and appreciative. Someone once said about show business, “Always leave them wanting more.” (Was it P.T. Barnum or Gypsy Rose Lee?) I think I can speak for the audience and say, yes, we really did want more. As lovers of mostly instrumental music, we are a demanding bunch and ask a lot from the artists and music we love. Najee is one who delivers every time. We heard his versions of “Can’t Hide Love” and “Sweet Love, “both crowd pleasers. I am also glad I got to hear some of my own personal Najee favorites, including “Gina,” “Najee’ Theme,” and everyone’s favorite, “Noah’s Ark,” the song he wrote for his son many years ago. “All I Ever Ask,” is fast becoming one of my favorite of his live performance songs. He originally recorded this one with Freddie Jackson, but guitarist Chuck Johnson does a fantastic job with the vocals on this one. Throw in “Mind Over Matter,” and his latest single, “Champs Elysees” from the new release, and it was an evening of great music.